Looks like the design kids over at Supremebeing (watch out, noisy link) have got all printy for their Spring Summer Collection. 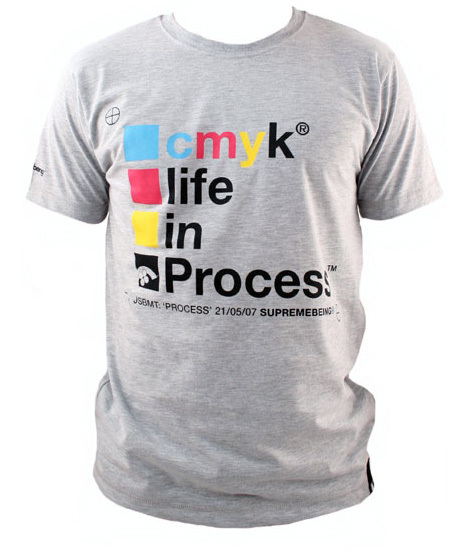 There's their CMYK Process T-shirt up top, with registration marks and everything, available in grey and white, from Stand-Out.net. And then there's their set of individual Cyan, Magenta, Yellow and Black Ts, available from Urbanindustry.co.uk. Very tasty. Thrill your friends with your great fashion sense, then bore them for hours with explanations about the intricacies of lpi vs dpi, spot varnishes and stochastic screening. FOOTNOTE: We're still hankering after a rather lovely CMYK T that the V&A shop was selling for a while, which had a circle for each of the CMYK letters, each of which looked like they were dripping slightly. If anyone knows who did them, or where they're available, do give us a shout. Cheers!